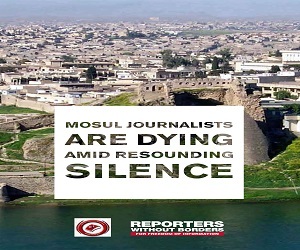 The JFO “Journalistic Freedoms Observatory” expresses its deep concern regarding the local journalists’ lives who work in Mosul after the ISIS’s recent arrest campaign that reached 14 journalists and media workers, while holding still Six more journalists since taking control over Mosul City last June 2014; after a new list of 50 more wanted media workers that issued by ISIS, the local journalists there demanded to be rescued before ISIS carries out a new arresting campaign against them. Local journalist informed JFO that within the last Two weeks ISIS have arrested more than 14 journalists and media workers, after their houses were raided in different neighborhoods in Mosul city. The 40 years old journalist adds with clear fear reporting to the JFO “Most of those who were detained are Sama al-Mosul TV channels’ workers, headed by Athil al-Nujaffi, the governor of Nineveh and funded by the local government of Mosul, before ISIS took over the building on the 10th of last June. The JFO was able to identify 12 abducted local journalists in ISIS’s custody, and their names are (Qais Talal, Sama al-Mosul correspondent, Walid al-Agidi and Ashraf Shamil, whom both work for the same channel as Cameramen, Ahmad Rafiah and Eithar Rafiah, both work in the montage department, Salih Hussein, Muhammed younis, Yassir al-Qaisi, Yassir al-Haj and Mahmood Shakir, whom work in the technical department, in addition to “Abu Shahad” whose age is over 50 years old and works in the reception of the channel building) while JFO was unable to identify the other two held by ISIS. Another correspondent, aged 35 known as former worker for a TV channel in Mosul city, told JFO “a tribal source was within a group of negotiators tried to play a role to release the detained journalists, informed their families that ISIS didn’t issue any punishment, yet, the journalists are held as a precautionary procedure according to what one of the ISIS’s judges had told the tribal’s negotiators. Living inside the city of Mosul, another journalist told JFO “ISIS detained the staff of Sama al-Mosul channel after accusations of providing breaking news reports from inside the city to “Nineveh al-Gad” which is a channel owned by the governor Athil al-Nujaffi, and based in Kurdistan, North of Iraq”. Throughout its representative in Mosul city, JFO was able to expose that Ali al-Noffali whom used to work as a cameraman in the provincial council of Nineveh for Four years, was detained by ISIS inside the citytTwo months ago. 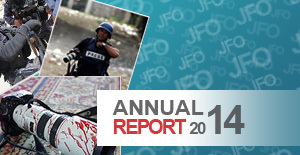 According to JFO’s statistics and until the moment of releasing this report, ISIS still holds Six writers, journalists and cameramen in Nineveh since the 10th of last May, named; (Fadhil al-Hadidi, writer and journalist and Muhand al-Egadi, reporter) while the statues of each of ( Maysalon al-Jawadi and Jamal al-Massri, anchors in al-Mausilya channel) remain mysterious; it is worth to mention that ISIS detained and then set free more than 17 journalists in the same city, after interrogating them and forced them to sign commitments of stopping their media activities, including quitting using their personal cell phones”. Lately, Journalists informed JFO that ISIS issued a new “wanted” list of other journalists, whom would be detained in the upcoming days, which caused fears among them; especially when they can’t leave the city. 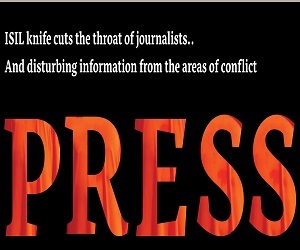 At the same time JFO condemns the brutal actions committed by ISIS of kidnapping and holding 20 journalists, it encourages all the journalists and media worker in Mosul to take caution until suitable mechanism is determined in corporation with the Iraqi authorities to provide safe shelter in the Capital for those journalists whom their lives are threatened.